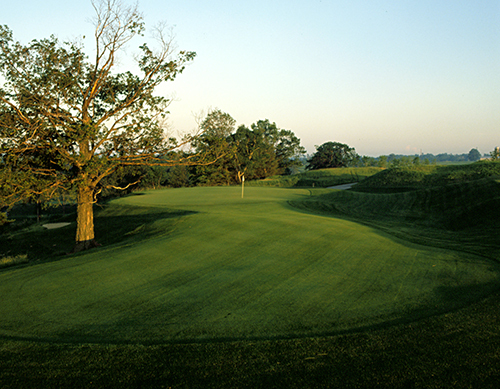 The third nine opened in the summer of 1989, and an additional nine the summer after that, totaling 36 holes. Utilizing eight of the existing holes from the original Blackwolf Run and nine of the new holes, Meadow Valleys was created. 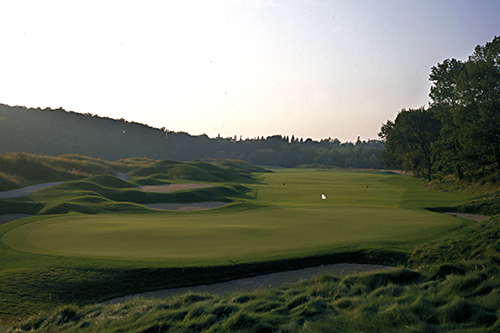 This second 18-hole course is considered the most playable of what eventually became four courses at Destination Kohler. It looks and feels more like a traditional Wisconsin golf course, the rolling, farmland feel with silos in the distance, than the other venues. The River Course is an absolute stunner. It features the daunting Sheboygan River on twelve holes and is an extremely scenic parkland experience, heavily wooded, with abundant wildlife. It’s a bit more target oriented, with accuracy more of an imperative in comparison to its adjacent neighbor. In autumn, golfers get more to remember than just the changing colors of the trees. There’s also a salmon run in the Sheboygan River, and anglers vie for prime position on its banks with the same sense of urgency as do the avid golfers lining up for tee times. Dye’s artful integration of the new holes is somewhat overlooked, owing to his headline-grabbing creation several years later---the otherworldly Whistling Straits. But for significant championships, most notably the 1998 and 2012 U.S. Women’s Open, the original course, now routed among the 36 existing holes, is played in a composite fashion. There is great precedent, as it is much like Boston’s 27-hole Country Club being played as a composite 18 for numerous U.S. Opens, or as it was for the 1999 Ryder Cup.